Located just over a mile northwest of 1840s Carrollton Inn, Mount Vernon is the cultural center of Baltimore. A walkable neighborhood filled with art, history, and spectacular food and drink, Mount Vernon is one of the city’s oldest and most treasured neighborhoods. It’s easily accessible by car or bus: the Purple Line of the free Charm City Circulator serves the Mount Vernon neighborhood, and parking lots and metered street parking are convenient. “Do” Baltimore like a local and venture out to one of the most culturally and architecturally diverse neighborhoods in the city. 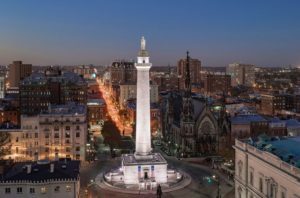 Did you know that Baltimore had its own Washington Monument over 30 years before Washington, D.C. built theirs? 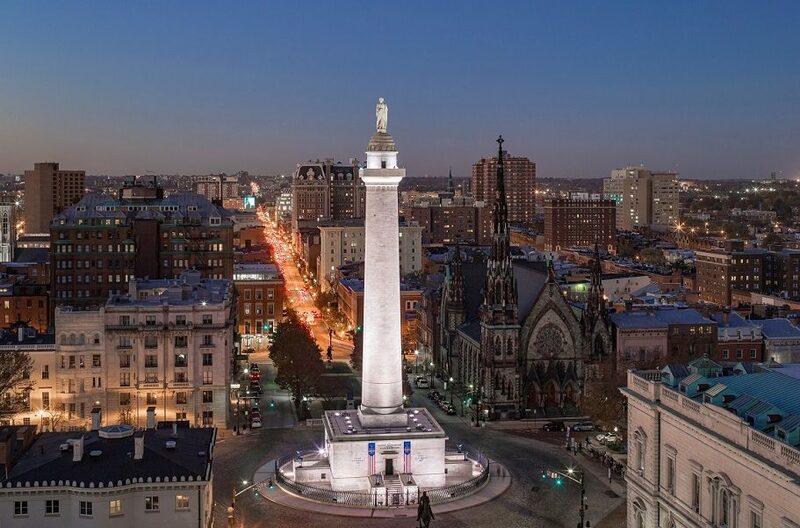 Climb the 227 marble stairs to the top for gorgeous views of the city, or visit during one of many events at Mount Vernon Place, like Summer in the Squares or the monument lighting ceremony the first Thursday of December. Free admission to the gallery and digital exhibits. Tickets to climb to the top are $6 for adults, $4 for children. Open Wednesday-Sunday 10 a.m. to 5 p.m. The Walters Art Museum collection contains art from around the world spanning over seven millennia, from Roman sarcophagi to 19th century European art and beyond. Its extensive permanent collection plus an exciting calendar of temporary exhibitions make the Walters a must-visit. General admission is free! Open Wednesday-Sunday 10 a.m. to 5 p.m. and Thursday 10 a.m. to 9 p.m. If you walk inside and feel like you’re in a fairytale, there’s a good reason: the Peabody served as the inspiration for the library in Disney’s Beauty and the Beast. 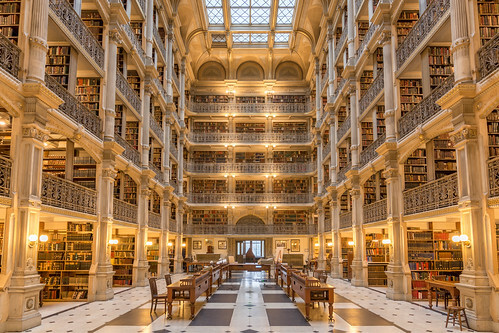 The George Peabody Library is a Johns Hopkins University special collections library, exquisitely designed with an enormous open-air atrium. Visitors can explore the first floor and exhibition gallery. Open Tuesday-Thursday 10 a.m. to 5 p.m.; Friday 10 a.m. to 3 p.m.; and Saturday 10 a.m. to 1 p.m.
As the official State Theater of Maryland, Center Stage offers some of the best professional theatre experiences in the region. Whether you see a revitalized classic like Tennessee Williams’s Cat on a Hot Tin Roof or a contemporary production like A Wonder in My Soul by Marcus Gardley, there are plenty of options for a lovely night at the theater this 2018/19 season. Have an elegant dinner in the dining room of this converted townhouse, or head downstairs for American bar fare. Brewer’s Art is locally famous for its house beers – try the Beazly or Resurrection. Tasty Afghan cuisine in the heart of Mount Vernon with lots of vegetarian and vegan options. A must-visit for fans of spice and flavor. Reservations recommended. This gastropub lives inside an old and beautifully renovated firehouse. There’s handcrafted beer on tap and pub grub on the menu, perfect for lunch, dinner, or drinks. The best steakhouse in Baltimore! Perfect for a birthday, anniversary, or simply an elegant night on the town with complimentary valet parking. Reservations recommended. 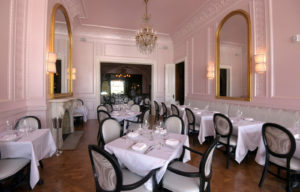 Globally inspired cuisine in a chic, elegant space. Reservations recommended. Staying with us for a special occasion? Check out our dinner for two package: have a romantic three-course dinner at the Elephant and return to a room decorated with rose petals, votive candles, mouth-watering caramels, and a dozen roses! Catch a free movie or musical performance at Mount Vernon Place every week this summer through August 22. Bring your own lawn chair or blanket and enjoy the show! Free popcorn on movie nights. Check the website for the full schedule. There’s more to Baltimore than our crab cakes: we made Zagat’s 30 Most Exciting Food Cities in America and many award-winning chefs call Baltimore home. During Baltimore Restaurant Week, you can sample the best of Mount Vernon and the city at special rates: a three-course dinner at the Prime Rib for $35 is an absolute steal. Restaurant week deals are also available for Brewer’s Art, The Elephant, The Helmand, and more. Be sure to make your reservations! If you want to experience the charm of Charm City, Mount Vernon is the place to be. Fabulous architecture, green spaces, and a myriad of art, entertainment, and cultural offerings make this a favorite neighborhood for locals and sightseers alike. These are just a few of our favorite places: ask the front desk or send us an email for other recommendations in Mount Vernon and beyond. We’d love to help you plan your visit!